Fourth largest telco network operator in Nigeria—9Mobile has launched a low-end phone which costs just NGN 14,000, dubbed '9Mobile Rhino 2'. Though the device doesn't have those groundbreaking feature, it will be copacetic to people who're just starting the Android life. The need to own a smartphone has gone beyond calling and texting. At least, one should be able to check his/her social media pages, WhatsApp, read emails and unwind with some cool games, but with the price of devices nowadays, some people just stick to their old Java phone. 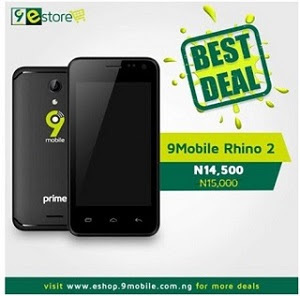 9Mobile Rhino 2 Prime 1 is packed with a 1GB RAM, 8GB internal storage, powered by a Quadcore processor clocked at 1.3GHz. The smartphone featiures a 2300mAh battery capacity running on Android v7.0 Nougat. For the cameras, the device comes with a 2.0 mega-pixel rear camera and a 0.3 front facing shooter. See detail spe below. Guys, this is simply Christmas and new-year gift. Again, it costs N14,000 and can be purchased here on 9Mobile E-store.